Facebook karney ko jee karrtaaa hai!!! The mind is like a horse – works well when reigns are pulled. If left to itself, it just goes out of control. Till yesterday, stressed by exam fever, my mind was at its creative best. It was brimming with ideas, pleading me to pen them down. And come today, with stress gone, my mind is in its own world. All the ideas have vanished in thin air. Me wonders what to write…. I have shared my blog with a few friends and listening to their reviews, I feel on the top of the world! Thanks all of u for your encouragement! Thanks to your encouragement, I am confident that regardless of whatever CGPA I fall into, I will surely do something good in life. Well, now a serious problem I want to share with you all. Unknowingly, I have become a blogaddict. Sounds cool but I feel like a fool. I have a monstrous exam tomorrow and while others are busy practicing, the blogger in me has overpowered the studios me. Blog addiction is worse than any other addiction. Coz when u feel the urge, u have to satisfy it there and then. And your creative mind can have the “Eureka” moment anywhere – in the middle of the lecture, on the road,in the metro, at a social gathering, in the washroom or even in the middle of the night. If not addressed at that moment, the idea vanishes, leaving behind heaps of regrets. Reminds me of my amateur poetry days. The peom had to be penned down the moment it was thought! Since stress brings the best out of me, I have given in to my Eureka moment. And I have convinced myself to rush to preparation the minute I upload this (result will be the same anyway, so might as well give myself a few moments of joy). Today’s blog is dedicated to a very special member of my project group thanks to whom, I have spent 2 precious hours of my preparation time completing something that was HIS responsibility. As I dug deep into the error full work he had done, I almost reached my boiling point. And he simply made a cute face and told me, “This is a group effort. Please complete it. You can vent out your frustration later via your blog!” All through the process, instead of taking onus, he has been simply doing status checks & motivating us that he trusts our capability. To top it all, when I was taking notes in the class, he asked me to compile everything and mail him a ready reckoner! Wow! Whoever said diversity enriches the group should come now and take tomorrow's exam on my behalf. And as for the group member, on an optimistic note, I’m glad he atleast made an effort (though an effort full of errors). But then, in the words of all the bosses in this world, that’s what people management is all about! 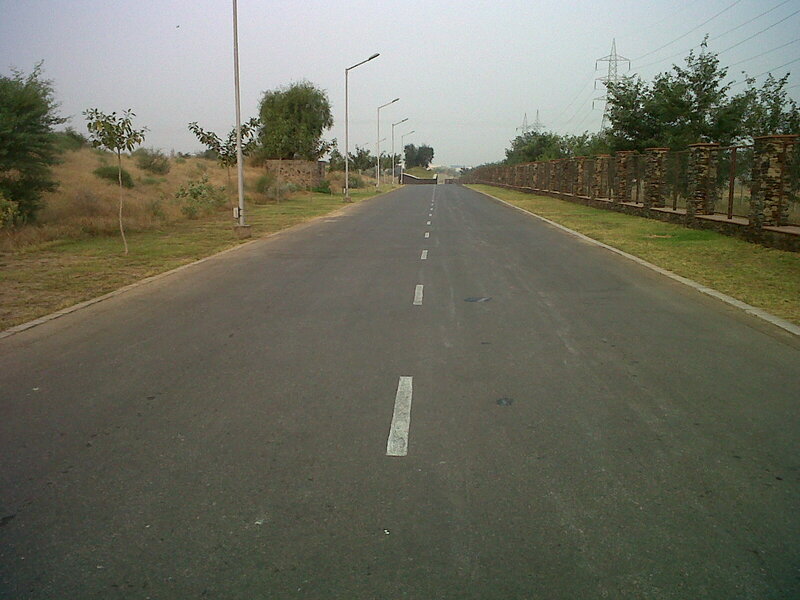 Few days ago, I was at Neemrana mod to catch a bus. And look at what I saw! 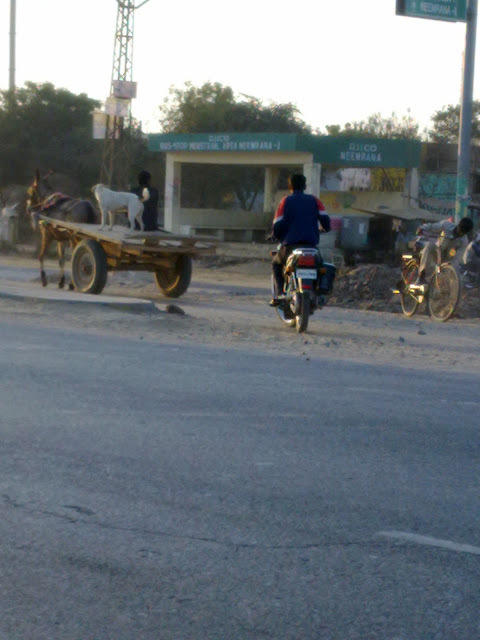 The doggie on this cart looked like a maharaja enjoying his ride. He seemed glad God made him a dog and not a horse else he wouldn’t have had this luxury! I immediately nicknamed him "Raja". I am sitting in a boring lecture. I usually am a 100% attendance person and try my best to be attentive but this particular class is as torturous for the students as it is for the professor. I look at him…words flow like a rap, you can just feel the bass without making sense out of the song! Since time is as judicious as the non renewable sources of energy, I thought why not spend this 1 hour doing something I like! Lets blog! So I began thinking what all can be done and in the process traveled from my school days to college, to office training sessions & MBA days. Surf net on your phone. Update your friend about the latest gossips. This isn’t an exhaustive list. Please feel free to contribute for the benefit of anyone who in future may refer to this blog to explore options while stuck with a boring, buzzing professor. 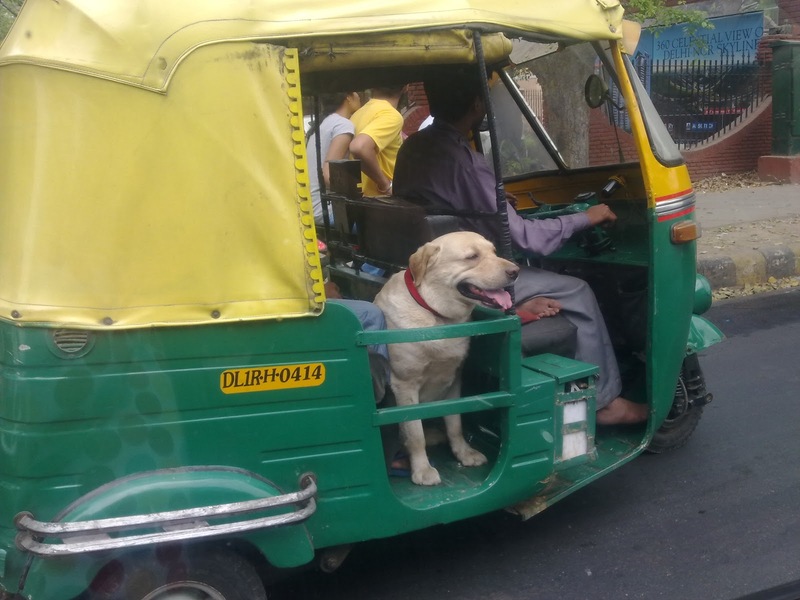 Delhiites love to take their canine companions with them wherever they go. The lush green spaces of central Delhi provides ample opportunities for dog lovers and u’ll see many people flocking to Lodhi Garden with their proud possessions. While passing by Amrita Shergill Marg, I saw this dog at the traffic signal in an auto rickshaw. He looked well fed and taken care of. Being used to the comfort of air conditioner, he probably wasn’t enjoying the autorickshaw ride & so chose to look outside for timepass! He looked too cute & adorable & the shutterbug in me just couldn’t resist. Here’s a pic…isn’t he cute? A leader is born, not made. And when they walk, millions walk behind them, trusting the path they follow. Such a leader was Bal Thackerey. I have never seen him nor been to Mumbai, but sitting in Delhi, I have always heard of his headline making comments in media. When he roared, the roar reached Delhi in no time. I was feeling not too optimistic about his state when I read 2 days ago that filmstars cancelled their events to visit him and when I read about his demise in the morning paper, it reminded me of my mother’s demise last year. Since I lost my mother, I have developed a kind of empathy with every departing soul. Whenever I come to know of someone’s demise or see a cremation mass, I pray for peace of the departed soul, strength for his family and happiness for my mother, wherever she is. Sometimes, when I see a corpse being taken to the cremation ground, I silently ask him/her to tell my ma how much I miss her. I know it sounds weird, but when u suddenly loose someone u love so much, u crave for even an atom of that soul. As the last rites were being telecast on TV, I could see his son, trying to hold his emotions, following the directions of the priests. Celebs too are humans. There are moments when you feel like being alone and manage your grief. But when their happiness is public, so is their sorrow. And he looked alone among lakhs of people who joined him in his grief. I’m a born Brahmin, brought up in a house where garlic was a forbidden item; married in a family where eggs are considered something that destroys your dharma, or religion! So, u can well understand my exposure to carnivorous stuff. The sight of tandoori chicken or kebabs arranged on skewers fills my olfactory senses with all sorts of foul smells. Lately, I have been spotting many outlets with the usual stuff (looks like chicken parts) hung on skewers. But wait! the signboard mentions 100% vegetarian! Wow! My friends tell me soya tastes almost like non veg. I decided to give these a try. Mom in law was super skeptical. The sight of the usual things on skewers made her cover her nose in anticipation. I reassured her it’s just soya, the one we cook at home. There were no chairs, no classy crockery, yet I was amazed to see the crowd which grew as dinnertime neared. Just six round tables with a pack off tissue papers on each. The waiters wore no uniforms but could be easily identified as the busiest lot, hopping between the tables, cash counter and kitchen, making a mental note of the order sans any order pad. There are no errors; the right dish goes to the right table, or the car. There is something about street food. The outlet opens by 7 each evening and the daily footfalls might give any restaurant an inferiority complex. Delhiites can go to anywhere as long as the food suits their palate. Its futile waiting for table there, so people mostly enjoy their treats in their cars. We managed to get a corner table, below a peepal tree and the waiter hurriedly kept a menu card and left. Mom in law and I felt like total amateurs. So many treats to offer out of the simple soya! Hubby ordered Soya rolls while we went for the malai soya chaap with rumaalis. Succulent soya wrapped around ice cream sticks, marinated in a blend of spices, immersed in creamy gravy, here was malai chaap. I told mom in law, “this is what you looked at covered your nose, I am sure you wouldn’t want to have this!” She smiled and pounced on the treat accompanied by unlimited onion rings and green chutney! But I went gaga over their rolls! You see I’m a rolls afficionado. From the street side corner below my office to wah ji wah, soya express, I try ‘em all. But this was simple and yummy, no greasy sauce, no oil dripping out of the rolls. I enjoyed the chemistry between soya marinated and roasted to perfection, and soft, warm, thin layer of the wrap. I could actually concentrate on the original taste of soya without irritated by the oily, greasy sauce. To add to this, the onion rings and chutney kept me asking for more and the waiters obliged with a smile every time. At 120 bucks, the treat was just not bad! One of the best soya rolls I had so far! 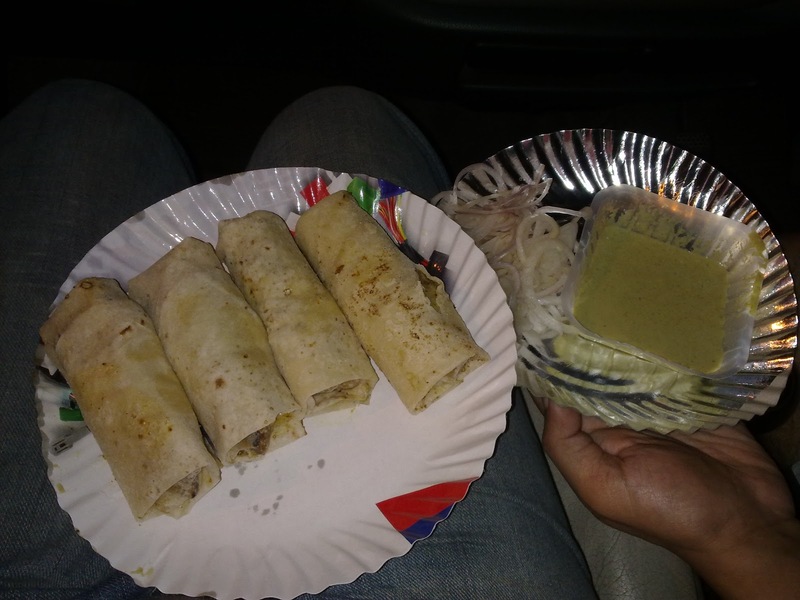 We have become regulars now, though now, we too enjoy the rolls in the comfort of our car. 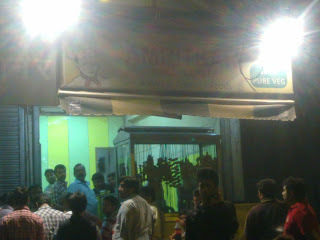 The Amritsar chaap corner is definitely must a visit for those who love rolls sans the greasy sauce and oil! 1st things first, the rice & moong dal mixture have to be soaked in water. But I was so hungry that I completely forgot about it. Anyway, I took some desi ghee in my new Borosil microwave safe bowl, put it in the microwave for 1 min, then put some laung & peppercorns that my mom in law had happily packed in the bowl. Once they cracked, I put the rice & dal mixture (washed 2-3 times with fresh water) along with spices (salt, red chilli powder, turmeric) & poured enough water to match up the height of index finger. 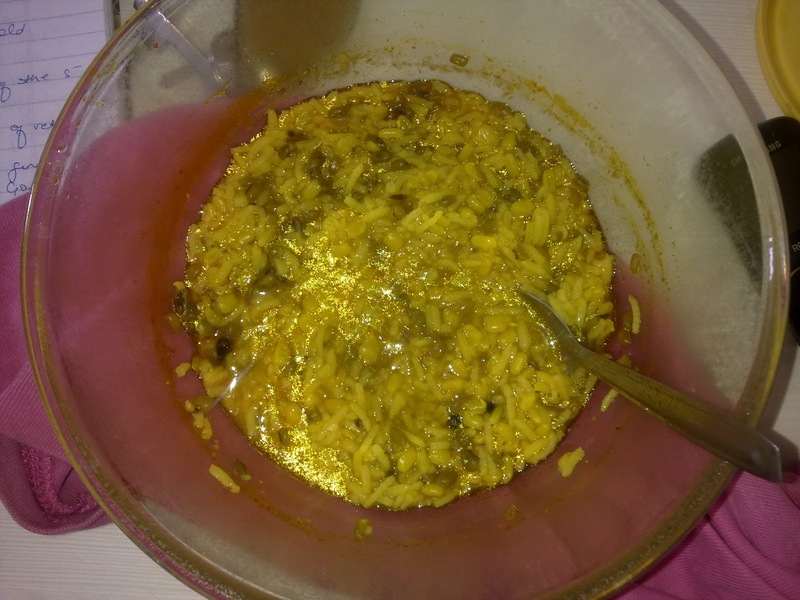 Then, my khichri was off to the microwave at High for 15min. These 15min transformed me literally to a hungry doggie! I knew it would take at least 10min or even more (since I hadn’t soaked the mixture) however, the intense hunger had me hovering around the microwave every 2 minutes. As I waited for the khichri to get cooked, I remembered how my mother used to prepare the perfect khichri in pressure cooker, served with huge dollops of ghee & chopped onions. I used to hate it back then, but now I crave for even a single morsel of her dish. Wonder if mine would even have the right spices. I wondered how good is it to have families, the best support system in whatever you do. I had just uttered that I wanted to cook on my own whenever the menu was bad at mess. My super caring husband had without delay, bought me the microwave bowls, desi ghee (so that my skin remains good in winters), the khichri mixture & a lot of other goodies. Mom in law had lovingly packed extra laung and spices & told me a 1000 times to put enough water & check with someone regarding Microwave cooking. Gosh! I was missing home. Beep Beep Beep! The microwave signaled me the khichri was ready. Here it was, slightly watery, the dal not mashed as in cooker. But, the aroma of ghee, laung & peppercorns was amazing. Spicy & piping hot, it just made my day! During Diwali cleaning, I found my school slam book. As I flipped through my entries, I realized how diverse my interests were. The column “best friend” had a long list of friends in my group, “movies” included my favorites & probably the favorites of my sisters, friends…hehe. Same was the case music, books, colors and other things. And now, things are so different. Coffee means my hubby’s special whipped to perfection, tea means only ginger tea and I would rather stay hungry than eat pizza without corn. Do we become selective with age? I wondered. True. And to reinforce this, I probed my 13yr old niece & her friends. To my surprise, they all sounded like I did in my teens. Every answer was carefully crafted with the most happening, chic and cool options. To them, more meant cool, and a way of showing how much they were aware of the “happening” things. I asked my niece “who’s your best friend?” “Alia, Neeti, Neha, Dhruv, Mayank…. She just went on and on.” They don’t teach good grammar at school, I thought. “Beta, best means one THE best, the one you like the most”, I said. “Oh masi, I love my entire group! We hang out a lot, look so cool together and are so happening. The entire school is so J (jealous) of our gang”. It is only when I asked her who would she confide in if she had a breakup that she came up with one name. Just like I had so many favorites mentioned in that slam book years ago, my niece had so many answers when it came to movies, books, hobbies and music.” I will ask these questions again after 10 years baby,” I told her as I left. But why do we become so selective with time? When we are young, we want to show off how cool we are, want to be the best, and so whenever asked to make choices, rather than thinking what we like, we think what will make others think we're cool. As we get into the rut of life, we realize the most precious thing is our own happiness; our “ME” time and learn to value quality more than quantity. The same me who loved to be seen with the biggest gang of friends in school, now prefer few but true friends, who I can trust. Instead of piling calories for the sake of others, I now prefer to focus on wholesome, well prepared, healthy food that will make me feel good. I would rather celebrate occasions with people I care for than with big group of people who don’t know the real me. If I have to spend 3 hrs on a movie, I would rather watch the genre I love rather than going for the most popular one. Instead of stocking my closet with anything and everything coming my way, I now shop for clothes I feel will really suit my persona & have learnt to discard the old ones. I have now realized the relevance of letting go of what no longer suits me, have learnt to focus on the things I really like, prioritize my time who I can count upon and the most sought after “me” time. Most importantly, I have learnt to communicate my preferences without the fear of rejection. Maslow rightly placed affiliation needs at the top of his need hierarchy pyramid. And often we don’t communicate our choices fearing the reaction from others. If we learn to put our foot down, speak openly what we like and what we don’t, give our true opinions rather than being populist, believe me, it will give tremendous boost to our happiness quotient. It will also earn us true friends and well wishers who know and value the real us. Quality and not quantity is the key. “Hmmm…wisdom”, I said to which my mother in law laughed and said “wait another 10 yrs & every choice by default will be tweaked to match that of your kids”.